(Minghui.org) Berlingske, one of the largest newspapers in Denmark, published two full-page articles on October 12, 2016, revealing the state-sanctioned organ harvesting from prisoners of conscience in China. The articles were titled, “When political prisoners are killed to order” (Når politiske fanger bliver dræbt på bestilling) and “Members of religious movement used as organ storage” (Medlemmer af religiøs bevægelse bruges som organ-lager). The two articles were based on interviews with Canadian human rights lawyer David Matas during his trip to Denmark. “Members of the religious movement used as organ storage” (Medlemmer af religiøs bevægelse bruges som organ-lager), published by Berlingske, a Danish newspaper with a 260-year history. “When political prisoners are killed to order” (Når politiske fanger bliver dræbt på bestilling) published on the newspaper’s website. The author of the articles, Mikkel Andersson, introduced in great detail the results of the 10-year long independent investigation on forced organ harvesting by David Matas and former Canadian diplomat David Kilgour. The articles also highlighted the new report, Bloody Harvest/The Slaughter: An Update, based on the collaborative investigation by Matas, Kilgour, and independent reporter Ethan Gutmann. The first article focused on the scale and evidence of the state-sanctioned organ harvesting. In the updated report, three investigators concluded that the Chinese government is carrying out the killing of prisoners of conscience, whose organs are sold at high prices to foreign patients as well as Chinese. The report lists a variety of evidence. One of the most striking is how quickly organ tourists can receive transplants in China. The article says that China has a voluntary donor register, but according to Chinese authorities, only 1,400 donors registered in 2012 and 2013, while the official figure for transplants in China, according to CNN, is 10,000 annually. Matas pointed out that the huge difference between the official figures and donors comes from the prisoners of conscience. “The prisoners are killed to order,” the article says. 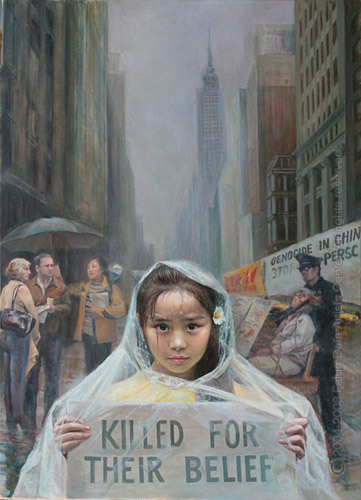 The second article focuses on the largest groups of victims—Falun Gong practitioners. The author briefly introduced Falun Gong as a traditional Chinese meditation practice, which was very, very popular before the persecution of the practice started in 1999. During the persecution, many practitioners were arrested. Many of the detainees refuse to reveal their identities, for fear that their families will be held responsible by the government. The article states, “This means that the authorities do not know who the detainees are, and that family and friends do not have the opportunity to know where they are detained. Matas told the author of the articles that many organ recipients did not know where the organs came from. “But when told, they were deeply shocked. My impression is that many of those I have spoken to would not have accepted the organ if they had known this,” Matas said. Matas now works on criminalizing the transplantation of illegal organs at a global level. (Minghui.org) Although Falun Gong practitioners have been persecuted for their belief in China for 16 years, some people in the West are still unaware. And like so many people in China, even those who have heard about Falun Gong are often confused about the nature and rationale behind the persecution. Below are some conversations that took place over the weekend when Danish practitioners went to downtown Copenhagen telling passersby about Falun Gong. Pedestrians read posters about Falun Gong in downtown Copenhagen over the weekend. What Has the Communist Party Done to China? Many pedestrians read posters about Falun Gong and the suppression in China and agreed to sign a petition in support, but one man in particular said he would not sign the petition. He was from Sweden, and in his 50s. “Do you have any concerns about this?” asked one practitioner. “I see,” said the practitioner. She then explained that Chinese people did not choose or like the communist party. Instead, the regime was forced upon Chinese. Through the past few decades when the CCP is in the power, it has mistreated a large portion of Chinese people in various political campaigns. “Right now, almost everyone dislikes the Party,” added the practitioner. Two people sign petitions to support Falun Gong in efforts to end the persecution. After one Danish man signed a petition calling to end the atrocity in China, he did not leave. “Please tell me, Jiang Zemin is just one person—how could he start a nationwide suppression like this?” he asked. One practitioner explains to passersby the severe human rights violation in China. (Minghui.org) The recent wave of lawsuits against former Chinese dictator Jiang Zemin has received support in Denmark. Practitioners held a signature drive on Copenhagen City Hall Square on August 29, 2015 to raise awareness about the lawsuits being filed. Since May 2015 over 165,000 Falun Gong practitioners and their families from Mainland China and throughout the world have filed lawsuits against Jiang for launching and directing the persecution of Falun Gong. According to Chinese law, any individual with knowledge of a crime can report it to the Chinese Supreme Procuratorate and Court. Acting on this law, many people in the Asia-Pacific area have signed criminal report forms in the last two months, echoing the lawsuits. Similar signature campaigns are also taking place in Europe. Many people in Denmark signed criminal report forms to support the movement to bring Jiang to justice. Two women and their colleagues signed criminal report forms and a petition prepared by DAFOH (Doctors Against Forced Organ Harvesting), calling for an end to the forced organ harvesting from living Falun Gong practitioners. One of them returned after a while. She said she wanted to get more people to support this signature drive. She took Falun Gong informational DVDs and other materials with her. An older man, whose feet were in pain and had plagued him for years, had been looking for a traditional oriental method to alleviate his pain. He was drawn by the practitioners’ peaceful and gentle exercise demonstration. A practitioner told him that Falun Dafa has benefited millions of people physically and mentally with its tenets of Truthfulness-Compassion-Forbearance and the five sets of exercises. After he learned about Falun Dafa and the persecution that practitioners have been subjected to in China, and the recent tide of filing lawsuits against Jiang Zemin, the man signed the criminal report form to express his support for the lawsuit against Jiang.